Let's get this blog thing out the way. We were awful. There are no other ways of saying it. Awful. I thought we would beat Newcastle at home and that's not complacency. If we have any aspirations of winning the Premier League we must beat teams like Newcastle or West Brom for that matter but to be blunt we are struggling a bit. Today was a low point in result and performance. I try to stay positive on here but after today you'll have to excuse me. I've been lucky enough to see quite a few championship winning teams and I'm afraid, deep down, this is a squad that is missing that special something. As I write this the Chavs (south) have just gone 2-0 down. Great but we will make no ground on them today if they lose and we have to if we are at home to a team we should beat. Newcastle brought nothing to the game apart from too much hair and yet they won. We just brought nothing. The something special we do have is Cesc and he is obviously struggling with the injury. Today he was below average at best. He makes our team tick. He makes our team great. Today he was asleep and, like Bagpuss, when Cesc goes to sleep his friends go to sleep to. I wanted a big win today so I could title this 'Rapper's Delight' after the tabloid rubbish yesterday. I wanted to have a rant about spending £6 on a limp chicken and chips in the ground. I wanted to make a comment on the flashing advertising boards driving me mad but I won't. I should take about our defending for their goal or how there we two covering defenders when Kos got his red but I can't be bothered. I wanted to write about our goalscorers. Wolves will be right up for it and so must we. 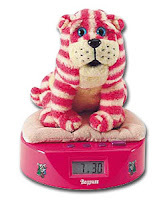 Set the Bagpuss alarm clock for Wednesday. Hear hear. Shockingly off the pace except maybe at the start of the second half when we created loads and had them on the back foot. We just looked flat, barely won a single header all game and let Carroll, Nolan and Barton have the freedom of our half. Newcastle are no pushovers, their divisional title last year and current league position point to that, but if we think we BCD genuine title aspirations we have to be a lot lot better than today. And fast.